Mongolia Yurt rules - how to behave in a nomadic yurt? The yurt is a symbolic representation of the wold as Mongolian people see it (see our "symbolism of the Mongolian yurt page") . In reference to the sacredness of nature and the spirits that inhabit it, many rules must be respected when entering the yurt of a traditional Mongolian family. The yurt, oriented with the door facing south, is crossed by the cardinal axes, and the central pillars represent the connection between earth and sky. It is therefore important to respect this very strong and universal symbolism. 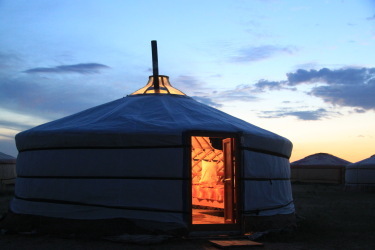 We gathered in this page the most important rules to follow if you are invited to enter the yurt of a Mongolian nomad family. These rules are simple, study them well, so you will apply them as naturally as possible, to allow free rein to the pleasure of meeting once you're there. And remember, a smile and a friendly attitude always arouse understanding and indulgence of your guests if you "commit a faux pas!" If the door is closed, do not knock before entering. Always enter the yurt right foot first, without stepping on the threshold, or even touch it with your foot: step over it carefully with the right foot and head to the left side of the yurt . One of the major interdictions is: never pass between the two central pillars. Do not stand and sit on the bed that is left of the entrance door. It is possible that your host then asks you to come and sit beside him at the place of honor opposite the door. Of course accept his invitation with pleasure. When you are inside the yurt, keep your hat on and do not enter with something that could be considered a weapon in hand (horse riders leave your whip out...). When you sit, especially on small stools or on the floor, do not stretch your feet to someone or to the fire . The easiest way is to sit cross-legged or keep your legs folded under you. If you are invited to sit on the right side bed, be careful not to pass between the two central pillars, although they are often the most clear way. Go behind them, without stepping over someone who would be sitting on the floor. Get what you are offered with both hands, or with the right hand and your left hand supporting the right elbow. Eat or drink foods that you are offered, or at least taste it. If it is alcohol and you do not drink it, dip the lips politely. When you receive something for the first time, especially vodka, you can make an offering to the spirits by dipping your right ring finger and sending three times a drop in the air in three different directions. There is no need to dip your finger three times, once is enough. Generally speaking, accept what you are offered, it is a sign of politeness. You may cut a piece of boiled meat, often presented in a large metal bowl. In this case, it is helpful to have your knife with you. The fire being particularly respected, never throw waste in it. At the period of Tsagaan Sar, some additional rules must be respected. You will find on the table a kind of "marriage cake" made ​​of an odd number of layers of large biscuits topped with sweets. You will be offered to help yourself, in this case touch the base of the cake with your left hand and use the right hand to take sweets (do not eat the big cookies!). You will also probably eat buuz, traditional dumplings with meat, whatever the time of day, it is an essential custom at this time of year. Probably one of the nomads will give you his snuffbox at one time or another. This is a sort of small round stone bottle with a cap that is simply pushed (do not try to screw or unscrew!). Accept it, open the cap and smell the snuff through the opening. You can also completely remove the cap and put some snuff on your hand with the stick attached to the inside of the cap, to smell it also. Close the cap and give it back to your host with your right hand and thank him. Do not give it directly to others who are with you, give it back to its owner unless he invites you to to give it to others. Finally, upon leaving, you can respectfully greet your host, or the oldest person in the family, stretching your arms toward him/her, palms up. He/she will answer, advancing in front of you and placing his/her arms on your own, as if you would support him/her. You may then mimic a hug (very dignified and without effusions! ).